The Popes of the Middle Ages became powerful and highly influential. This was the period of the Crusades where thousands of Medieval Christians, rich and poor, old and young, from all walks of life travelled nearly three thousand miles to the Holy Land. 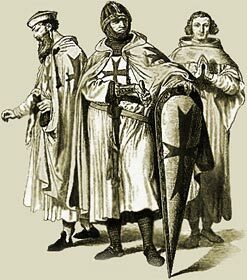 The Militant religious zeal of the popes and the promise of redemption from sins made the crusades popular. The Catholic church became the universal and unifying institution. However, n 1054 there was a split between the Eastern and Western Christian Churches which was prompted by arguments over the Crusades. This split was called the Great Schism. The religious fervour of the Popes in Medieval times transferred into medieval society. A centralized Catholic church was realized under Pope Innocent III in 1198. The church and the power of the Popes was eventually weakened by quarrels between church and state. The Hundred Years War and the Wars of the Roses led to the end of the Feudal system and the emergence of the modern nation state. The Medieval religious reformers of the late Middle Ages and the Renaissance culminated in the Protestant Reformation. The Medieval Life and Times website provides interesting facts, history and information about the religion and philosophy which scatter the Medieval History books including details of the names of the Popes in Medieval times. The Medieval Times Sitemap provides full details of all of the information and facts about the fascinating subject of the lives of the people who lived during the historical period of the Middle Ages. The content of this article on Popes in Medieval Times provides free educational details, facts and information for reference and research for schools, colleges and homework for history courses and history coursework.